As previously reported, Topps filed a trademark application for the letter V. In any style, format or font you can imagine, as well as for any "sports trading card." It's quite an expansive filing. To be fair, Topps isn't the first company to file for a trademark on the letter V. There are over 1,900 other filings for the letter V. However, not all of those filings cover "trading cards." Including Topps, there are only five of those. Three are pending applications. Two are registered. Legal translation: Three want Trademark Office approval. Two already have it. It's only registered use is for "trading cards," and was allegedly first used in 1995. 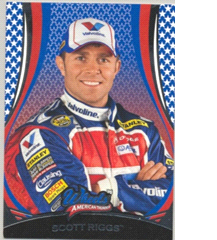 So, how does an oil company use a boring old V on trading cards? Ah. The Valvoline V. It looks much better in color. The other registered trademark is from another innocuously named company: Top of the Third, Inc., which does business as the Visalia Rawhide. Legal translation: That's the Class A Advanced minor league team for the Arizona Diamondbacks. 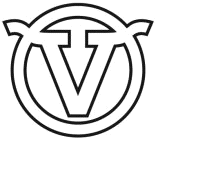 The Visalia V is a stylized V, which, in the registration's own words is a "letter 'V' made to look like the shape of a cow's head which is encircled to give the appearance of a brand from a branding iron." The mark was allegedly first used on December 28, 2008, and is registered for, among other things, baseball cards, like the Tyler Skaggs card from 2011 below. Now, both the Valvoline V and Visalia V are what we call potential "bad facts" for Topps because March 20, 2013 is Topps' alleged priority date. Therefore, Valvoline's 1995 date and Visalia's 2008 dates beat it. You see, Topps is trying to stake out land that covers any letter V for all sports trading cards. The Valvoline V and Visalia V, however, already have territory staked out, and approved, by the Trademark Office in two tiny sections of Topps' desired world. Also, isn't it great that Visalia already had their V circled? It's like it was made for a Venn diagram. Valvoline, you need to get with it! Topps could still overcome a rejection in view of the Valvoline V and Visalia V if it gets permission, and who knows, it might. 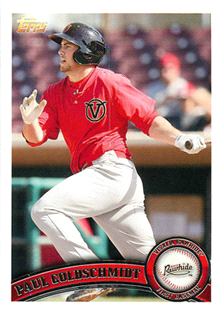 Topps has made cards of Visalia players in their uniforms for its Pro Debut and Heritage Minors products. But even if it secures Visalia's permission, Topps will still need permission from Valvoline and the two other applicants (if those applicants haven't abandoned their marks). Legal translation: Trademarks are in the "use it or lose it world." You can't just sit on a trademark. If you don't use it in commerce, it's gone. 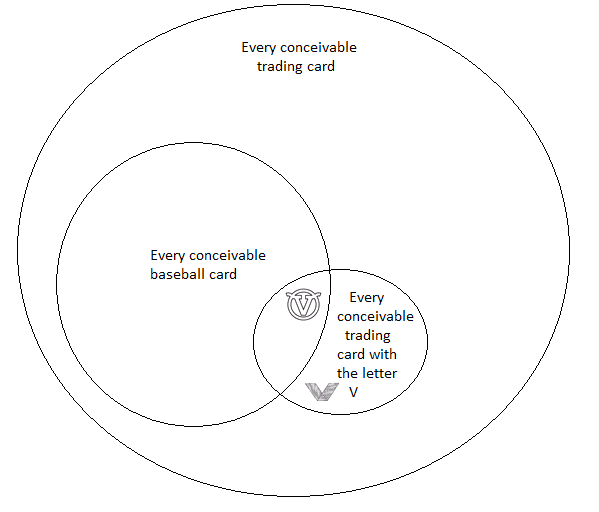 So, Topps' chances of getting the broad V it wants isn't impossible, but it'll be very difficult. I think it recognized this because it also has a backup plan: it also filed a trademark application for VALOR. 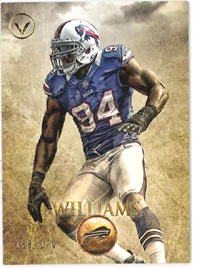 But hey, if Topps wants a V, it could just file on the specific Valor V Topps uses now on its cards. And it's already circled too. And it's just perfect for a Venn diagram to show how it doesn't interfere with the Valvoline V and Visalia V.